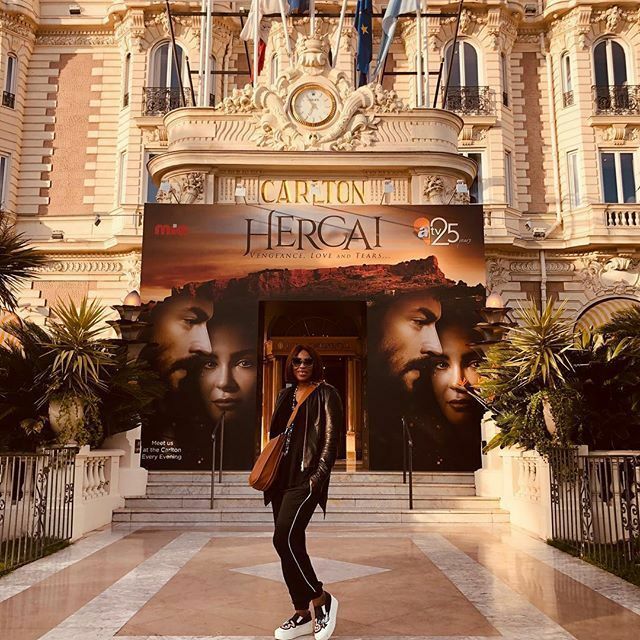 Top executives from the Nigerian TV industry were out in force on the first day of MipTV in Cannes today, with EbonyLife TV boss Mo Abudu and noted vlogger and web TV celebrity Linda Ikeji doing the circuit in the Palais des Festival. Abudu was in Cannes to receive a 2019 Médailles d’Honneur award at the MipTV conference and market, alongside three other recipients: US writer/showrunner Ilene Chaiken; Banijay Group chairman Stéphane Courbit; and Sky Vision MD Jane Millichip. The award is given to senior executives who have contributed to the development of the international TV community and to the world of TV. Abudu, who is a member of the International Academy of Television, Arts & Sciences board, is one of the most prolific producers in Africa. The Médailles d’Honneur awards were handed out at a prestigious cocktail and awards event tonight in Cannes, at the InterContinental Carlton Hotel, attended by the great and good of the global TV industry. Abudu was also in Cannes to moderate a panel session at the conference today, titled Global Hotspot: Producers To Watch From Africa. Joining the EbonyLife chief on stage were South Africa’s Kagiso Lediga, creator and executive producer of Queen Sono (Netflix); Shirley Frimpong-Manso, producer/CEO at Ghana’s Sparrow Productions; Courtney Williams, European regional director at Parrots Analytics; and Rethabile Ramaphakela, producer at Burnt Onion Productions of South Africa. The session explored how the appetite for new and original content has shined the spotlight on the vibrant and rising TV and film industries in Africa. This session focused on leading producers, hailing from South Africa, Nigeria and Ghana, whose stories and talent have been embraced by international audiences. Ikeji, boss of web TV service Linda Ikeji TV (LITV), was in Cannes not only to go to MipTV and promote the LITV catalogue to international buyers but also to attend the Nigerian International TV Summit (NITV) events that are scheduled to take place in France this week, including a conference in Cannes and another in Paris. “I’m honoured to be invited to showcase our work and plans for Africa,” Ikeji said of her trip to MipTV. In 2012, US business magazine Forbes named Ikeji as one of the most prominent women in Africa, while last year she won the United Nations’ Global Leadership award. Both Abudu and Ikeji posted pictures of themselves in Cannes via social media.